Heal Play Love creates music driven and spiritually influenced experiences that celebrate humanity. The first event will take place at Viertel in Basel. Join the community, meet new friends and discover our unique playground, our mystic healing zone, which is hosted by Vitamin Space and our new decoration. 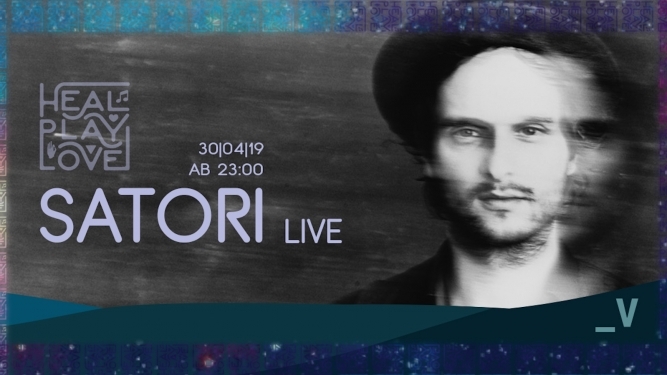 The event is headlined by Satori, indisputable one of the most remarkable artists of the past years. His music is not defined by any-one genre, it combines endless blends of seductive trance and mind-altering earthy tones. Satori is here to satisfy any meditative music-lover by provoking a spiritual journey through his infinite sound-garden. Milo Häfliger is indisputable Switzerland's pioneer of "Ethnic Melodic Techno", how he himself names the genre. In the past 3 years, he pleased crowds in India, Russia, Tunisia, Canada, Turkey, the USA and many other places all around the world. From the very first instant of each of his sets, Milo prepares us for an astonishing journey. Also Don Son from Wildfang Music can be considered as one of the leading Swiss based artists in this genre. We are happy having him alongside other great artists. The Line-Up of the night is completed by Multitask, founder of Basel's Tension Festival, Acid Flora and Planet Caravan,two new names on Zurichs electronic musician sky and Kreshna, co-founder of Heal Play Love who is playing b2b with Yasa.